New Milford Dog Park is an independent dog park and is not funded or managed by the Town of New Milford. We are managed by an all volunteer Board of Directors and are funded only by the generous donations of patrons and local business. ​"Candlewoof" New Milford Dog Park is a not for profit, all volunteer organization dedicated to providing a safe and secure area for dogs to play and socialize. New Milford Dog Park will promote responsible dog ownership and community education through our events and meetings. In 2007 a group of dog loving, New Milford citizens formed a committee with the goal of creating a dog park that would be a safe, fun place for their dogs to socialize and exercise "off-leash". In 2008 this goal driven committee joined forces with the New Milford Parks and Recreation to present their plan to then Mayor Pat Murphy. Then in 2009 the Mayor, after an arduous search decided upon the Kimberly-Clark 1.5 acre property on Pickett District Road, which had been leased to the town and was not in use at that time. The Town of New Milford then sub-leased the property to the New Milford Dog Park Organization with one major caveat; that this Dog Park would not be at an expense to the town and would be managed by volunteers and funded solely through user and public donations. With the realization of the "Dog Park Dream" nearly complete, there was one vital component missing that had to be addressed. In stepped a loyal dog lover, a highly regarded member of the New Milford community, and a leader within the New Milford Education system, Mrs. Francis Terry, who made a generous donation in the memory of her late husband, Norman Terry, for the fencing that encloses the park to this day. Fran's daughter, Susan Chapin, and Paul Mayer, also contributed to the the fencing, in honor of Mr. Terry. Welcome to New Milford "Candlewoof" Dog Park! 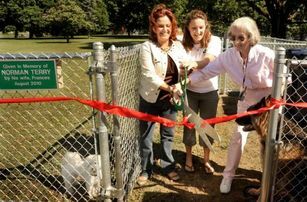 ​Photo at left: Tammy Reardon, left, Lori Sartwell, center, and Frances Terry, cut the ribbon at the opening the New Milford Dog Park, Saturday, Aug. 28, 2010.